Get your house ready for your Easter egg hunt and brunch with the family by DIYing some cute Easter bunny decor and snacks for your home. Here are some DIY projects that are fun to make in preparation for your Easter celebrations. 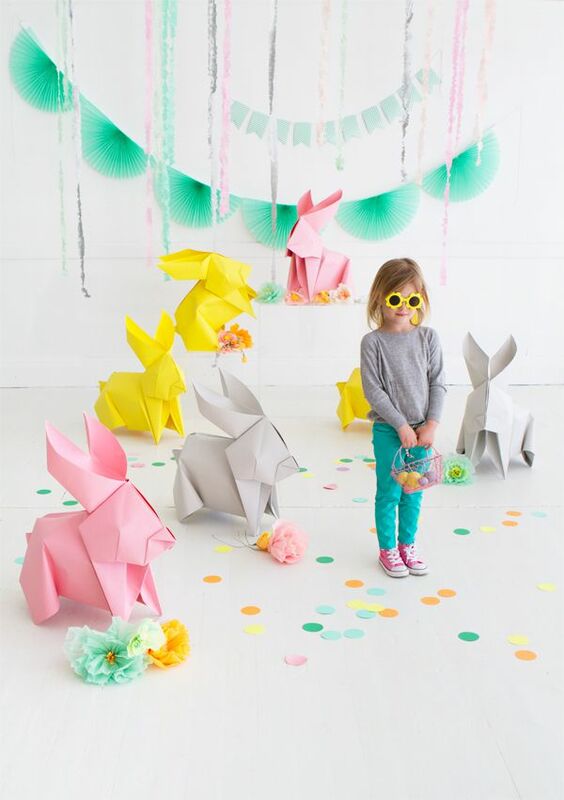 First up, decorate for your family's Easter egg hunt with some giant origami bunnies, from Oh Happy Day. Once the hunt for Easter eggs is over, make sure to gather the paper bunnies together, as they make great Easter photo props. This sweet Easter bunny banner from My Poppet is perfect for families looking to decorate their home for young children, and best of all it is quick to make! Just print the template and punch holes at the top of the bunny ears to string together your banner. How adorable are these Easter Bunny cookies? Decorate these easy white chocolate-covered cookies with the addition of marshmallow ears and a shiny pink candy nose. Make these for somebunny you love this spring! They also make for a fun weekend craft to get your kids in the kitchen. Showcase some spring flowers in your own DIY bunny vase, from A Kailo Chic Life. This would look amazing as a centerpiece for your table. Use some of the extra fabric scraps from your last sewing project to make this festive bunny banner, from Dream a Little Bigger, to hang on a wall in your home in the spring. Surprise everyone at your Easter brunch with this amazing Easter bunny cake, from Tell Love and Party. DIY some bunny-ear cake toppers to easily turn a loaf cake into a bunny. Enhance regular potted tulips into an Easter-themed gift by making this bunny gift tag, from In My Own Style, out of paper and chalk. You can tie it around the potted plant with the gift recipient's name. It's the perfect last-minute gift to thank the hostess for the Easter brunch you are attending. Create the perfect centerpiece for your table by gluing a plate onto a bunny figurine and painting them all the same color to make this bunny cake stand, from A Bubbly Life. It's perfect for showcasing your decorated Easter eggs. Complete your Easter brunch outfit with this amazing foldover clutch, from She's Got the Notion. It's decorated with a bunny face on the center that you can sew together easily and quickly. As an easy party favor for your Easter brunch, send all your guests home with one of these mini treat bags, from Tell Love and Party, decorated with a bunny silhouette. You can fill them with candies for a lovely parting gift. Cover your homemade cake until it is time for dessert at your Easter feast with this festive handmade bunny cake dome, from Sugar and Cloth. It's perfect to save and use every Easter. Instead of only giving your kids candy for Easter, give them a gift that will encourage their creativity. This Easter bunny chalk, from A Bubbly Life, is easy and fun to DIY. Enhance your homemade cupcakes with these adorable polka dot bunny wrappers, from Molly Mell. They are complete with fuzzy cottontails courtesy of mini pom poms. Do you need something to wear for the community Easter egg hunt? If so, you can create the perfect shirt to wear by making this iron-on bunny T-shirt, from Alice and Lois. It's perfect for your last-minute Easter prep. Getting a card in the mail is always a happy surprise, so this Easter, mail all your out-of-town family this Easter bunny greeting card, from Passion Shake. You can make the printable bunny design in minutes. Instead of a standard Easter basket, sew your child this DIY Easter bunny purse, from Alice and Lois. They can carry it over their shoulder while they search around the house for Easter eggs. Decorate your front walkway or around your yard with these beautiful burlap bunny yard flags, from Crafts Unleashed. You can use them to line your front walkway or to mark the bounds of the Easter egg hunt in your backyard. The teenagers and adults in your family will love these cute bunny bath bombs, from A Pumpkin and a Princess. They can use these bath bombs to relax while they soak in the tub. For a fun activity with the kids, teach them how to make this bunny bowl, from Alice and Lois, by shaping air-dry clay into a simple decorative bowl. Decorate your front door or inside your house this Easter with this moss-covered bunny-shaped wreath, from Dream a Little Bigger. It can seamlessly blend with most decorating styles.